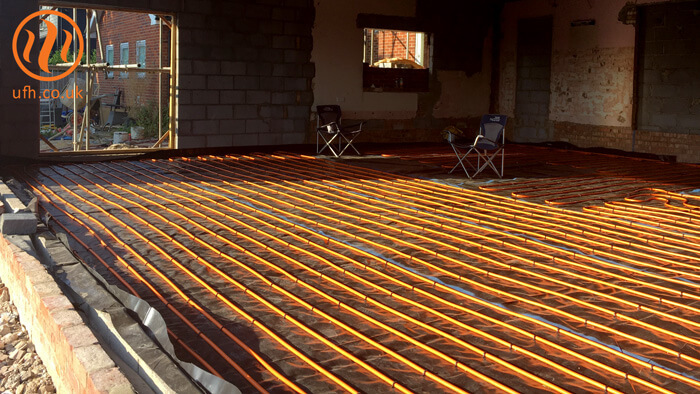 A new client needed an underfloor heating system for his new home. A friend in the trade recommended us, so he got in touch with our Technical Sales Advisers. The client wanted to heat his ground floor using underfloor heating. The ground floor consisted of a large open plan area with full-height windows. We realised that we would need to design the system a little differently to accommodate these large windows into the build. Our client’s window layout meant there’d be high heat-loss areas. To combat this, our Technical Sales Adviser knew the heating system would need more UFH pipe in the floor to keep a consistent heat output. We always make sure that our customers have one main point of contact at Continental. As well as providing a personal and friendly service, this ensures that all specifications are met and nothing can be miscommunicated. In this case, the need for more pipe was easily integrated into the CAD design. Having solved the challenge of the high heat-loss area, it was time to think about end-user control. Our client wanted to operate his heating system from his smartphone, so he opted for therM app-controlled thermostats. This feature was especially important as our client works long hours, and wanted to come home to a lovely warm house. At Continental Underfloor, we look at more than just floor dimensions to design a heating system. Areas with high heat loss need to be accounted for to achieve an efficient underfloor heating system. The finished system was completed with traditional screed flooring, creating an energy-efficient system that will heat their home for many years to come. Our client was delighted with the result – and with the service he received from us. To be as satisfied with your project, contact our Technical Sales Advisers to find out how we can help you. A Plumb Partners Group company. © 2019 Continental Underfloor. Terms. Privacy.